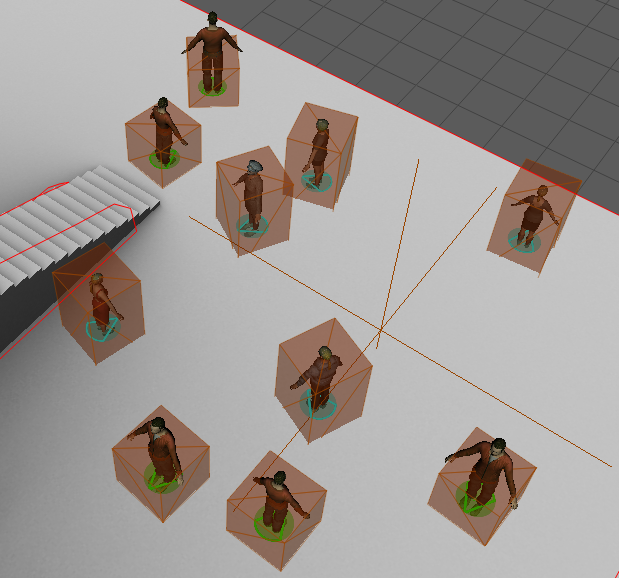 The Perception Locator defines the perception environment of a crowd simulation. It is used by the Activate Sensor Behavior and the Navigation Behavior. All objects that can be detected by sensors are added to the perception environment. A Perception Locator can be mapped to one or several Crowd Fields (directly or through the Crowd Manager Node). When a Perception Locator is shared among several Crowd Fields, the crowd simulations share the same perception environment, i.e. this environment will contain objects from all the aforementioned crowd simulations. If two Crowd Fields use different Perception Locators, entities from one Crowd Field won't detect objects from the other one and vice-versa. A Perception Locator is automatically created when an Activate Sensor Behavior, a Navigation Behavior or a Sensor Locator is added to the scene. These parameters define how the Perception Locator is drawn in Maya's viewport. These parameters cannot be set manually. They only offer statistics for the Perception Locator.